329 documented trick or treaters came to our door last night. That doesn't count the many turned away and the many not counted in the confusion. They devoured 11 bags of candy, 3 boxes of gummies, and all of the snacks in my snack basket. I started the night with 7 bags of candy. Then I had to use the eyeball candy for Lucien's birthday party today and then at At 6:45 I ran out of everything and made a candy run. (I do love the convenience of being on base.) 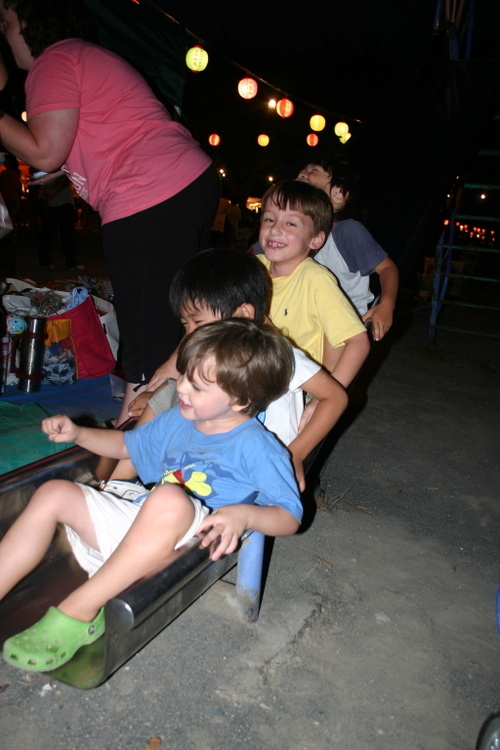 Crazy, crazy night in Yokosuka. We didn't realize that they let in Japanese children from the town. I'm not really sure how it works. I don't know if they were the children of the many locals who work on base or what but they arrived in masses. One group had 35 kids in it! Many of them bowed to me after getting their candy. Most of them clearly didn't speak English but their Moms made them say Trick or Treat and Thank you. Actually it was more like Tricka Treata. My three had an awesome evening. Halloween is Jude's favorite day of the entire year. I'm fairly certain because of the candy. So he was in heaven. Lucien was dressed as the scariest grossest ghoul he could find. What happened to my sweet little Harry Potter of last year? 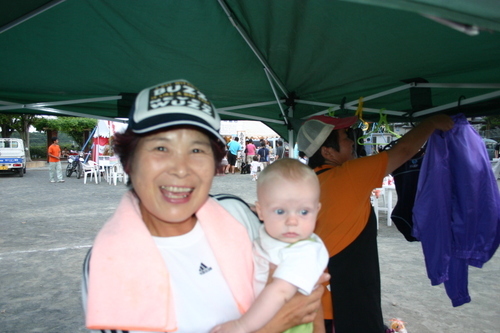 Anders who was in his second costume of the day, Yoda, delighted in the attention from all of the Japanese moms who love babies. Especially blue eyed ones in costume. 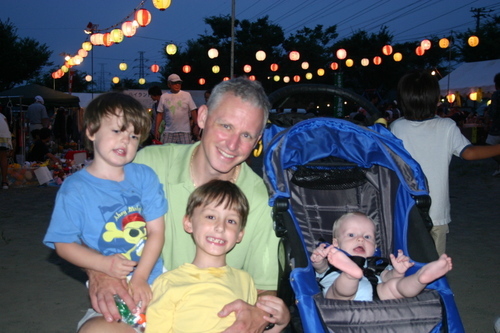 First Halloween event - Fall Festival at Yokosuka Co-op Pre-school. Ready for some candy (We did make Jude put on shoes). Gecko boy - costume #1 worn to daytime parties. We try to get off base at least one full day every weekend. Last weekend we drove down the peninsula to the Aburatsubo Marine Park. It was a little scary getting there but we made it. At the travel office there is a wall of flyers with train and driving directions to local attractions. Since most of the signs aren't in English the directions tend to be esoteric. Turn left at the second Dennys', (Yes there are Denny's here but the food is changed to suit Japanese tastes.) go straight for 18 lights and then turn right at small sign with this katana word. etc. So far they all have gotten us where we were going. Getting lost here would be a frustrating adventure. The aquarium was on the small side and none too fancy somewhere between the local Marine Science Center and a fancy New Orleans or Tampa Aquarium. However the petting tank had sharks, there was a dolphin show and some cute penguins. 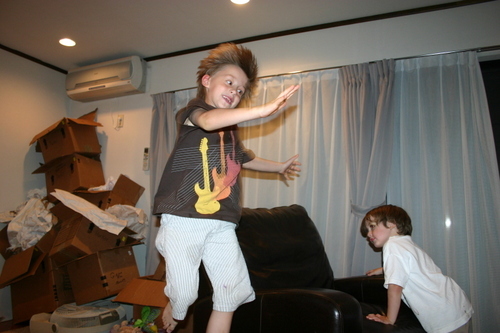 A hit with Lucien and Jude. Some of the fish names were in English! The PC police haven't made it to Japan yet because the big groupers were still called Jew fish. Yes, they let small children pet sharks here. Monday Lucien had a field trip to a farm and then to the Godzilla playground. He came home with 6 dark pink sweet potatoes. The inside turned yellow when cooked and tasted nasty with a very starchy texture. Too bad. We love sweet potatoes and the commissary only carries this type. I really must complain about this. How hard could it be to import sweet potatoes? IKEA: The agony and the ecstasy. We found ourselves in dire need of furniture. In Mississippi we had loads of cabinets and closets. Anders was sleeping in a corner of our bedroom with a bassinet and garage shelves to hold baskets of baby stuff. Now our office has no closet and Anders has a real room. On top of this there were a lot of things we put in storage knowing that our house would be little. Things are expensive in Japan so we don't want to buy at a local store. There is a furniture store on base that is unfortunately supplied and run by the Navy. As you can imagine it's not to my taste. The only thing to do in this situation was a road trip to IKEA. So a few Saturdays ago I got in the Emina and drove to the Yokohama IKEA while Brad stayed home with all three kids. If you are familiar with IKEA you understand why this was a do it by yourself all day affair. If you have never had the privilege, IKEA is the biggest home store ever. You walk through room after room of showrooms jotting down the appropriate numbers so you can pick up your items in the warehouse. They make you serpentine the entire expanse of the place before depositing you in warehouse to pick up boxes of flattened furniture to be put together at home. The prices are right and the designs are good sometimes even brilliant. This is all very good if you are in Ikea Atlanta, but in Yokohama I can't even begin to explain how truly overwhelming it is. 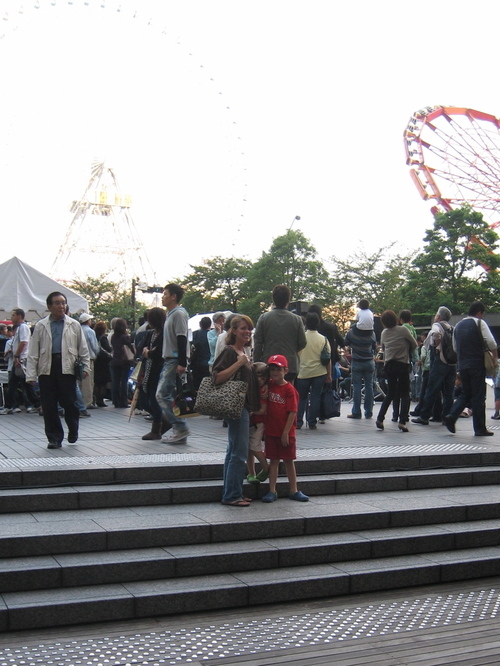 There is a lot of figuring out to do which is difficult when it is all in Japanese and the place is packed. There was an office bookcase thing I had to abandon because figuring it out was making my brain hurt. http://www.ikea.com/jp/ja/ (Try to navigate this website to get an inkling of what it's like.) There are few items that are just too big for me to get. I go home defeated. I relay the bad news to Brad that we will all have to return on Sunday. He takes it like a man. Sunday is the one day that we never ever try to leave base. The Japanese work on Saturdays and there is even school on Saturdays. Sunday is their only day to get things done so the roads and stores are nightmarish. It must be done though. We can't take another day in our disorganized house. As soon as the church bribery donuts are consumed we are off to Yokohama. On the way I tell Lucien and Jude about the cool ball pit and how they can play while we shop. All is good. Happy kids and we are on the road early. When we get there it is already so crowded that the only parking available is on the roof of the 4 floor parking garage. We still don't realize the gravity of the situation and head off to the ball pit. There are just a few families lingering. Good sign we think to ourselves. Brad takes them to the counter and is then directed to a number taker machine like they have at the DMV of deli. Our numbers are 401 and 402. The display says they are currently on #38. I kid you not. We now have two disappointed kids to drag around this behemoth not to mention Anders who is dangling off of my chest. We head up the escalator and into a sea of people. 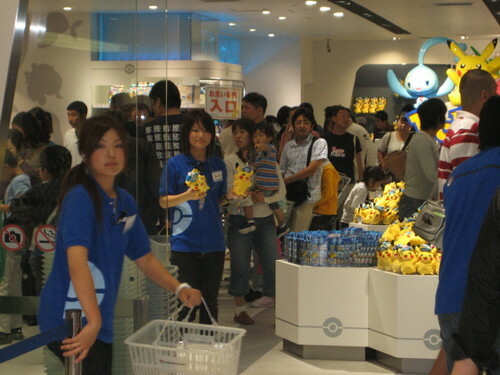 This is by far the most crowded store I have ever been in (only because we hadn't been to the Pokemon center yet). I'm having panic attacks and I don't have panic attacks. Brad has resorted to writing our cell phone numbers on the kids arms just in case they get swept away. But the people around us are nonplussed even happy and very orderly. Hours and hours later as we are leaving with 2 bookcases, a desk, a dresser, an office chair and various other items, we run into some friends. They had waited 20 minutes just to enter! I leave Brad to check out the ball pit situation. #397! What's a measly four numbers to wait? When their numbers are called I deposit my shoeless children (taking shoes off is big here) who are joyously jumping in the balls before I'm out of eye sight. Brad and I now have an hour to get these boxes in our van. Seems like a long time but we had a lot of stuff. With our cargo stowed and time running out I run downstairs to pick up my children. The ball pit attendant takes one look at me and announces "Rooshen and Judo, Rooshen and Judo" over the intercom. I collect Rooshen and Judo and we go home. 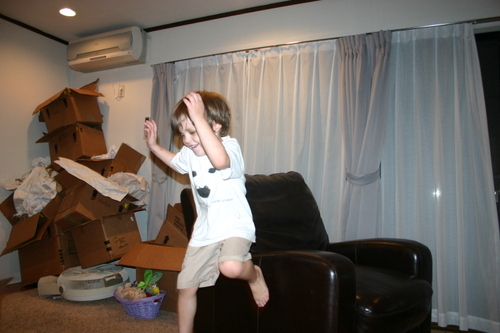 Epilogue: Brad had to go to Korea for a week and I took the opportunity to get the office furniture put together. My one bookcase looks awesome. The second one I accidentally put two of the shelves in rough side out. (I'm blaming Anders who was screaming and rendering my brain into mush.) I tried taking it apart and ruin it more. Brad comes home and thinks we should just go buy another one because it's going to drive him crazy. I remind him of what IKEA is like. We still have it and hardly ever notice the rough sides. Two nights ago I finished putting together the last piece. Offending bookcase. Office is almost complete. 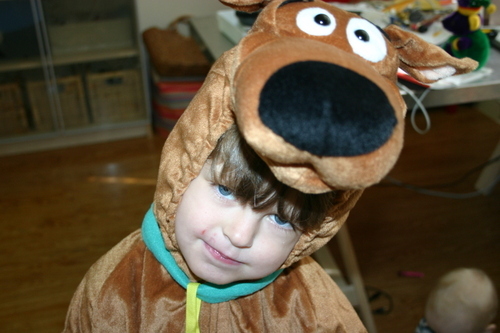 Jude wore his Halloween for two whole days after we received our buycostumes.com order. 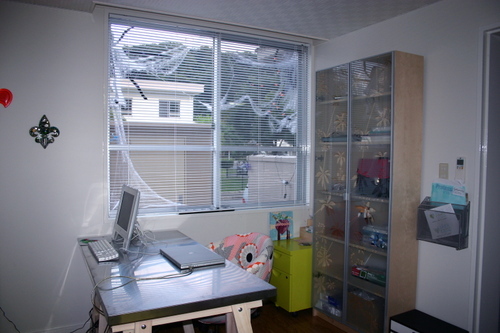 The mini-blinds are heinous but we aren't living here because of aesthetics. 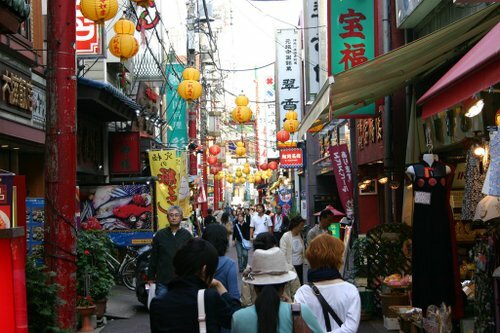 Yesterday we went to Yokohama which is the second biggest city in Japan and an easy jaunt on the train. 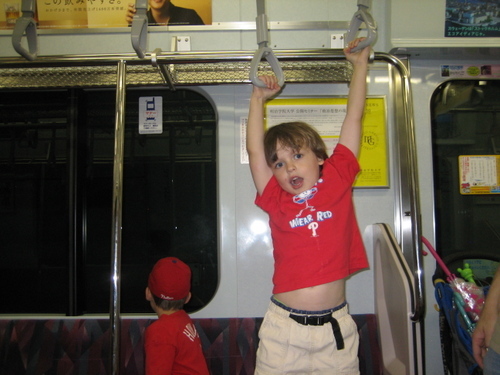 Not that taking a baby, a four year old and a six year old on public transportation is ever easy. Our first stop was ChinaTown. It wasn't at all what I was expecting. 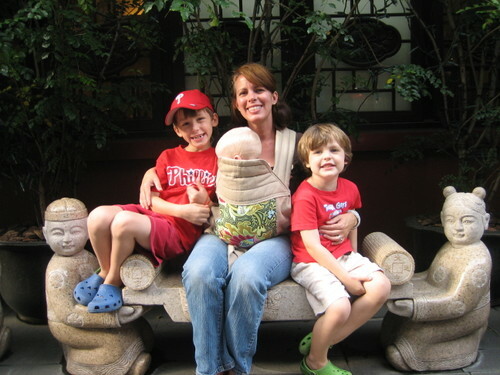 I've only been to the ChinaTown in New York City which is a functional neighborhood full of Chinese people. This ChinaTown was more like a Disney set catering only to tourists. There was an astounding number of restaurants. 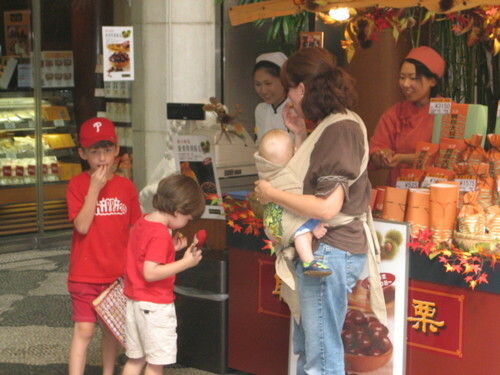 Unfortunately I couldn't find a true dim sum place with the roaming carts full of goodies. There probably is one but I didn't know how or who to ask. There is this particular dish that I love, shrimp in slimy noodles and oyster sauce that I am now completely craving. Couldn't find it. 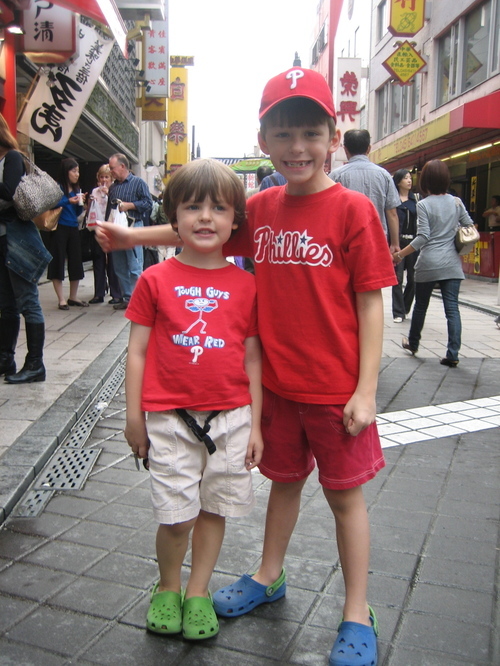 The big attraction in ChinaTown was Anders. People were stopping us to take his picture. I was wearing him in the carrier and wishing I had paid a bit more attention to my hair and makeup. At one point 3 different people had their cameras pointing at him at the same time. Almost all were ladies. Sometimes they make a circle with their fingers and point at his eyes. The streets were filled with vendors selling roasted chestnuts which like cinnamon rolls smell a lot better than they actually are. Steamed buns were everywhere. The Japanese are apparently crazy for Pandas because entire stores were solely devoted to them. Most of the stores were souvenir shops except for one really neat place selling all Mexican, Central and South American items. Go figure. Trying the chestnuts. Yes, Jude is spitting his out. Next we were off to Landmark Tower. The tallest building in Japan. Which is not why we went. 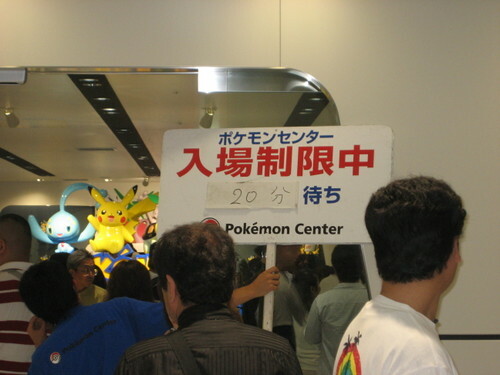 It is also home of Pokemon Center and Lucien has a birthday coming up. We thought we would run in and get him something and go. Man, were we ever wrong. The line to get into this place wrapped around the interior of the 4th floor of this mall and then down on the third floor! Stupidly I had told Lucien about this store and there was no backing out so into the line we went. While waiting in this tremendous line we were all anticipating a really cool store with maybe animated pokemons or a ride or something special. Wrong again. It was only a gift shop that didn't even look that cool inside nor was it big. So Lucien, Jude and I get through the crowd, Lucien picks out a few things and we proceed to the checkout. A very polite young lady stepped in front of us and directed me to an enormous line snaking through the store for the cashiers. The orderly crowd we thought were looking at toys was actually this mammoth line leading to 12 cashiers. Unbelievable. the sign reads, "If you think this line is long, wait until you get inside and try to pay for your overly priced items." Our "quick" trip to the Pokemon store took up the rest of our afternoon. Hopefully we'll be able to get back soon to ride the enormous ferris wheel and check out the art museum. Ferris wheel we didn't go on. Brad and I are always amazed by the trains and the stations. They are so clean and people do not talk on them. Every now and then maybe some kids will be talking extremely softly and that's it. 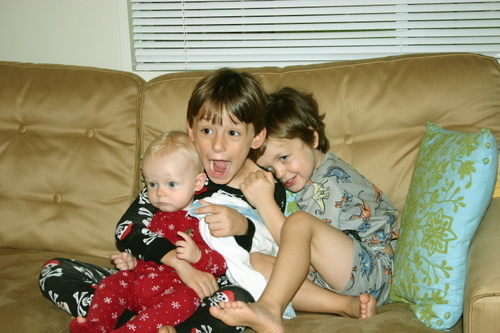 It's very hard to constrain two very excited little boys. Let's just say that everyone on the train is aware that Americans are there, even if we are out of their sight. The seats are upholstered and I would imagine a graffiti artist would be taken down with tactical precision if they even produced a Sharpie. Hanging paper advertisements are low enough so Brad has to duck yet not one of them was torn or written on. All of the announcements are automated and there are even lights on the platforms like at the movie theater. People stand in lines on the platforms and there are no homeless people or musicians. The Japanese must be truly terrified when they visit New York City. If I had to use the trains here all of the time, I think I would miss the characters. The conductor who freaks out at rush hour and yells things like "For the love of God get on the train already", "Move it or lose it, the doors are closing"; the homeless man begging for money and announcing that he is "home-a-less" not homeless but home-a-less. (I don't know why they say this but they do). Of course the musicians except for the steel drum guy at 57th street. I wouldn't miss him for a second. Since the Olympics were held on this side of the world you would think that we would be privy to the good stuff at prime hours, but not so. The only events I even saw this year were Ping Ping sorry Table Tennis, the shot put, and men's gymnastics. All of which were narrated in Japanese. They kept replaying Ping Pong and the shot put because apparently Japan swept up some medals in it. The only three I ever want to see are women's gymnastics, ice skating and equestrian events. No uneven bars or dressage for me this year. I did see blips of the guy winning all of the swimming meets but it was on the Today Show or CNN the following day. Thankfully they didn't see the shot put. So, Anders is fair skinned. And by fair skinned I mean a shockingly glowy white. My dear stepfather nicknamed him "Doughboy" and the child's own father has been known to call him Powder. I can't even get mad because, if the name fits... On top of his complexion he has Brad's fabulous blue eyes, which are also enormous. 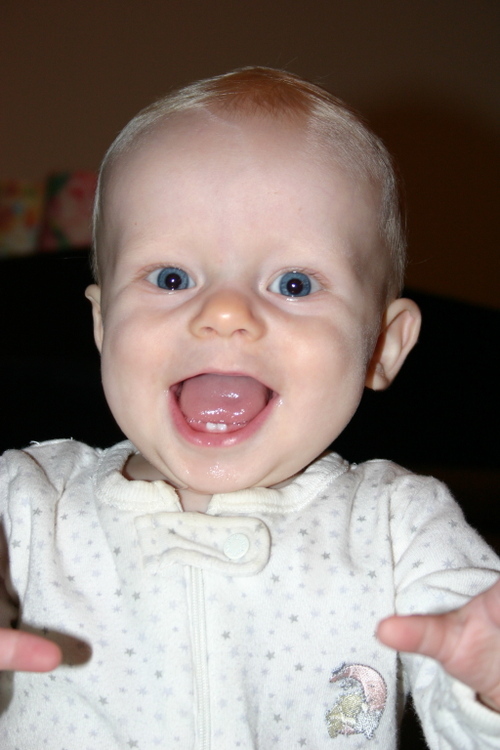 Not enormous in the cute baby way but in a startled way like he either saw a ghost or the Palin/Couric interview. These qualities have made him a huge hit with the Japanese ladies who can't keep their hands off of him. 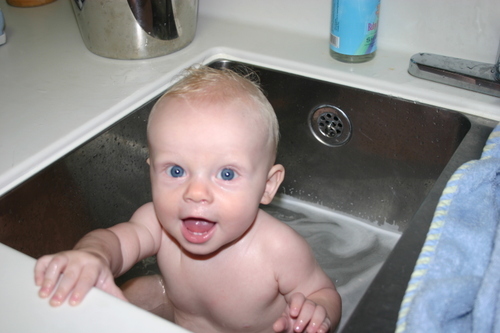 Anders in our curiously deep sink. When I was house hunting the real estate agent messed with him until he woke and then got him out of his carseat and proceeded to take him around the neighborhood showing him off. She woke a sleeping baby! Our second incidence happened at a sushi-go-around in a mall. The waitress plucked him out of his stroller and walked out of the restaurant with him. In the states I think I would have tackled her, but in Japan crime isn't a problem and there was no way could she pass him off as her own. Anyway, she absconded with our baby and introduced him to the shop girls in the area. Brad and I quite enjoyed having a meal with a built in free babysitter and will go back. 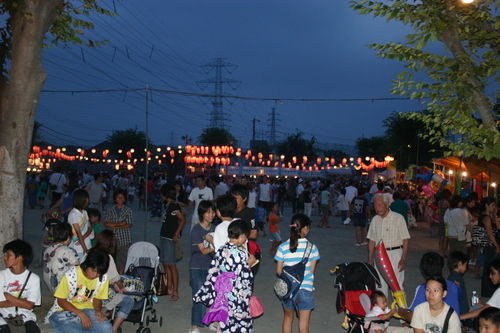 Another night our neighborhood was throwing a big summer celebration with booths, game and food in the local park. 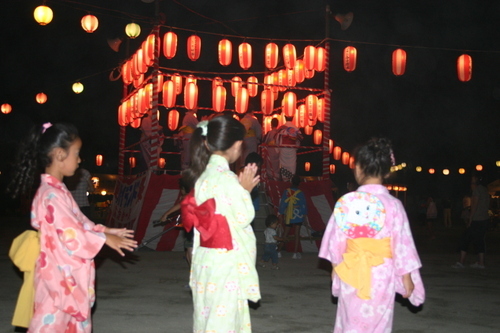 It was quite lovely with lanterns strung up and a lot of the locals wearing traditional clothes. The first booth we came to sold used clothes to benefit the local women's soccer team. One of the workers insisted on taking Anders. She probably would have held him all night but he was not in the mood for strangers. Yes, her hat says "A day without a buzz, is a day that never wuzz." I'm assuming she can't read english because she seemed like a lovely lady and not like a drunken frat-boy at all. 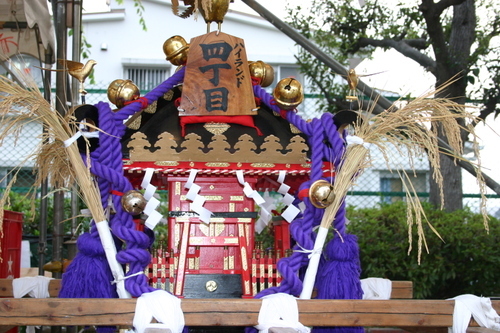 In the summer here almost all of the neighborhoods and towns have these fabulous festivals some are huge with fireworks displays and last several days. I think they all involve shrines of sort or another. The one we went to was on my birthday and we had just moved into the house a few days prior so it was very special. The food was interesting, the games fun and there was plenty of Japanese beer. 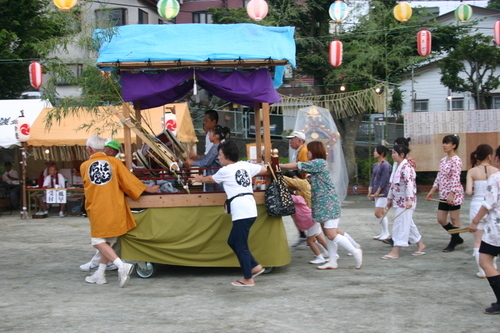 The shrines are carried around the streets and then brought to the festival. The carriers looked rather tired but were still singing and dancing and having a great time. Traditional dancers took the stage at night and someone or groups of people were always playing these big drums. Getting back to Anders. Almost everywhere we go in town women come up to Anders and say kawaii (sounds like Hawaii) which means cute. Or they say "3 boys, how lucky". Lucky indeed. Brad and I are worried all of this will go to Anders' head so every now and then we tell him that he isn't as cute as they think he is. Festival pictures. I had Lucien and Jude convinced that this party was being thrown for my birthday. 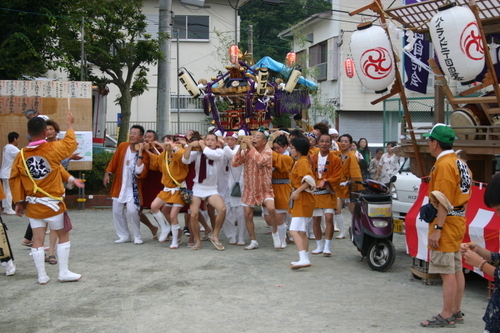 Carrying the shrine. Their pants resemble diapers and the white boots are camel-toed. The Parkers standing out. The nice thing about looking so different is we can always pick out our kids in the crowd. Big drums played being played by some kids. Little dancer girl with a kitty fan. This picture got very dark but Lucien and Jude are on a slide. The festival was held in our local playground one block away from our house.